I'm changing my tune from yesterday's whining: I think I can get this house 100%. Maybe I'm just on the upside of a bipolar episode, but last night I was able to scribe all the shelves in (future post) in a couple hours. 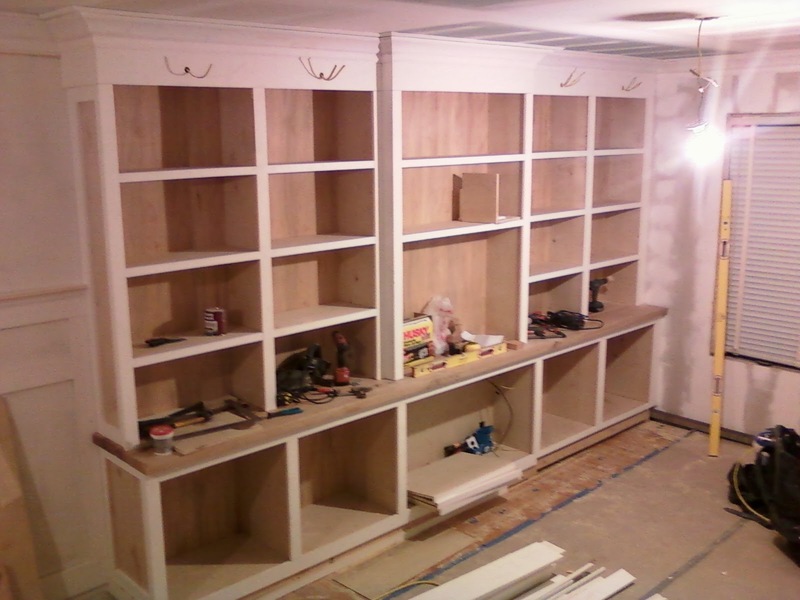 Had the laser out, shot some lines, made a template, set up a stop block and drilled holes.. and... shelves are in. Record speed. I really didn't want to do these this way (like so much that it hurts), but one of my co-workers told me that "done is better than perfect", in regards to something he had completed at work. He's right. Perfectionism is a savant-like syndrome, but is also simultaneously a bit of a cancer. I suffer from it. It helped me turn off my brain and work from the neck down. Undesirable 1/16" reveal where you don't want it? who cares. Can't get two shelves within a c-hair of level? split the difference. That cope isn't water tight? caulk-n-paint. And you know what? It looks pretty professional. Like, real professional. The only trouble is that I'm so tired that I don't know how I'm going to get through this weekend. The final rally. Walls and ceilings are getting primed today. Fri/Sat/Sun will be used to build a stool for the big front window [lots of scribing to fit into existing jamb(s)], finish out stairwell, baseboard [4 piece], and build custom little cabinets for the crappy little finned tube copper base heat. I'll have to wash all that down with a healthy dose of joint compound, caulking, nail hole putty, etc. for all the slop in this house. Those of you with 100 year old plaster walls can sympathize. The only thing that won't get done is finishing up the reclaimed oak I used for the counter of the built in. Largely because I don't know what I'm doing and I'm over budget for paying someone to finish it out. I don't build furniture (or built ins?) so I have no window into the worlds of shellac, varnish, boiled linseed oil, etc. Nor do I really care. At all. I just want this job done. Give me a suggestion if you have one. Its old growth red oak from an downed barn. Its not clear (somewhat knotty, with worm holes) but I bench top planed it already, and hand planed out any trouble spots. I'm on a steady diet of miracles from here on out. Will need some miracle juice. Aka: coffee. Thanks Nancy---its a climactic week, no doubt. BTW- It looks AMAZING!!! I am in awe of what you have done in this amount of time a true Herculean effort!!!! Nicely done B.I.L!